The Slidedoor IP65 drive is made from stainless steel, dust-proof and water spray resistant. Its guide system is made entirely from stainless steel. It is therefore ideally suited for use in automatic sliding door systems which are subject to the most extreme environmental conditions. 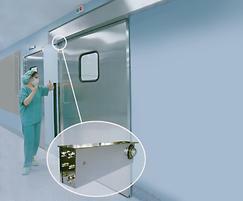 Internal and external sliding doors in buildings with rugged operating conditions and / or hygiene and corrosion resistance requirements - in swimming pools, on board ships, in buildings close to the sea, in slaughter-houses and cold storage rooms, laboratories, manufacturing buildings, saunas, mountain railways, etc.